Many of the supplies on the needs list can be purchased locally, and they are not expensive. If you would like to buy the items locally, please contact us at rvado@granpacifica.com. As the Roberto Clemente III Clinic at Gran Pacifica is relatively new, some furniture is still needed and can be purchased locally. The Roberto Clemente III Clinic at Gran Pacifica was built by many collaborators to benefit the people and families surrounding our community in Villa el Carmen Municipality. This Municipality is rural and large, with medical services difficult to access. The Clinic was built in 2016 and has been utilized by medical and dental missions providing services such as teaching parents how to work with differently abled children, providing much needed dental services, screening sugar cane workers for kidney problems, treating dehydration, and providing women’s health. Gran Pacifica Resort and residents donate to the schools of Villa el Carmen in several ways. We work with the teachers, community, and students to improve the quality of materials, teaching, and infra-structure, making sure sustainability is at the core. Many of the schools are located on dirt roads in a very rural area. We help with supplies and teaching English, as well as working to provide new latrines, improvements to wells, and access to potable drinking water. 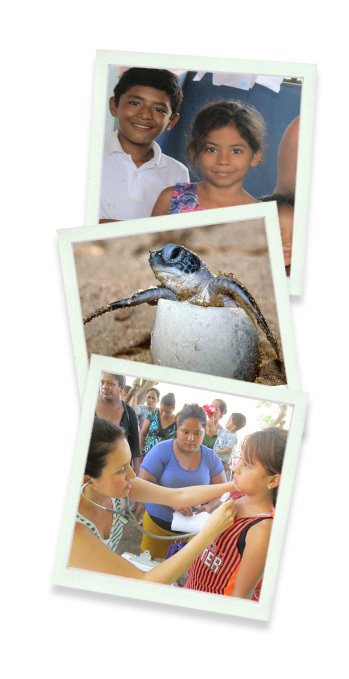 The Turtle Sanctuary at Gran Pacifica Resort is a collaboration with Help Them Help Themselves Foundation and Tranquilo Travel & Tour Company. The sanctuary is located on the Pacific Ocean, one hour west of Managua, Nicaragua, and has space for approximately 40 nests of eggs. The eggs of the endangered giant sea turtles are a local delicacy of the culture here. Gran Pacifica maintains a good relationship with the “Hueveros” egg Hunters, who seek to find the egg nests on the beach and sell them at market. We buy the eggs, and place them in the Sanctuary immediately to protect and preserve the species. That way, the Hueveros will earn a living and we will hope for a good hatch. It is a wonderful experience to release the baby turtles into the ocean knowing that the ones that survive can live 100 years, and will come back to the beach where they were born.